Angela joined TAP in 2002 and has created case studies and CEO referenceable outcomes with a stellar list of clients including Scentre Group; owner and operator of Westfield Malls, Bayer, Computer Sciences Corporation, SPC Ardmona, MasterCard, MSD, Thiess, Philips, Beiersdorf and The Institute of Chartered Accountants. Angela brings 20+ years consulting experience to her client engagements. Her specific expertise includes strategy development and execution, alignment of metrics, structures and systems to organisational strategy, and culture and leadership transformation. She is also an accomplished CEO and executive leadership coach. 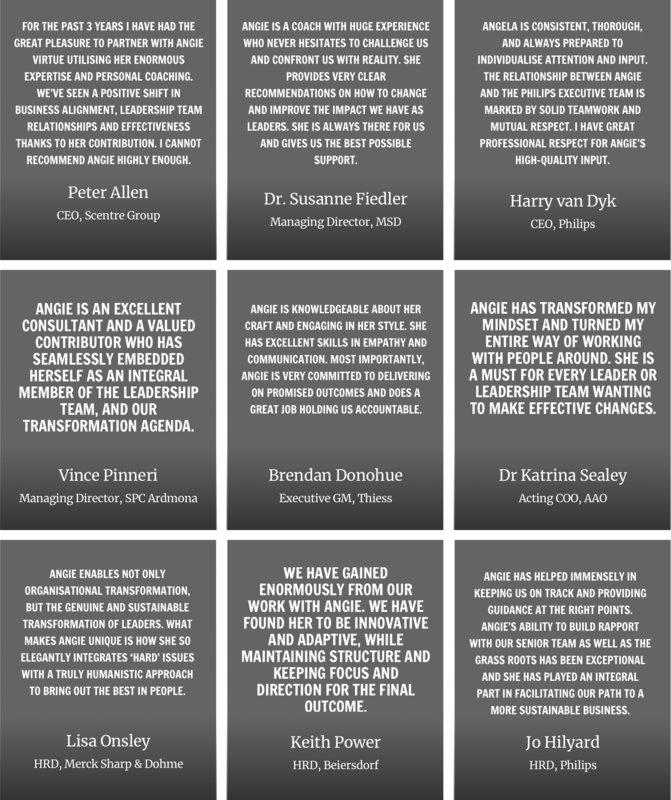 Angela’s consulting career stretches back to the early 1990s where she pioneered change processes in leadership, team effectiveness and cultural transformation. At the time, academics and organisations were only beginning to understand the link between leadership and commercial performance so Angela’s work was ahead of its time. Early clients included Bankers Trust, PepsiCo Restaurants and Unilever. By the late 1990s, the business community was grappling with massive internal and external change and the critical link between leadership, culture and performance was becoming evident in research. Angela’s local and international portfolio included British Telecom, Tanzania Telecom and Delta Electricity. Angela holds qualifications in Education and Teaching gained in Australia and the US. She holds master accreditation in all Human Synergistics diagnostic tools, is accredited in Myers Briggs Type Indicator (MBTI) and is a qualified Practitioner of Neuro Linguistic Programming.